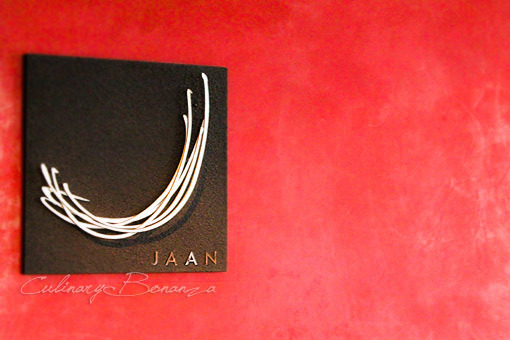 The name JAAN was derived from the ancient Sanskrit word for "bowl", hence the symbol of the restaurant. 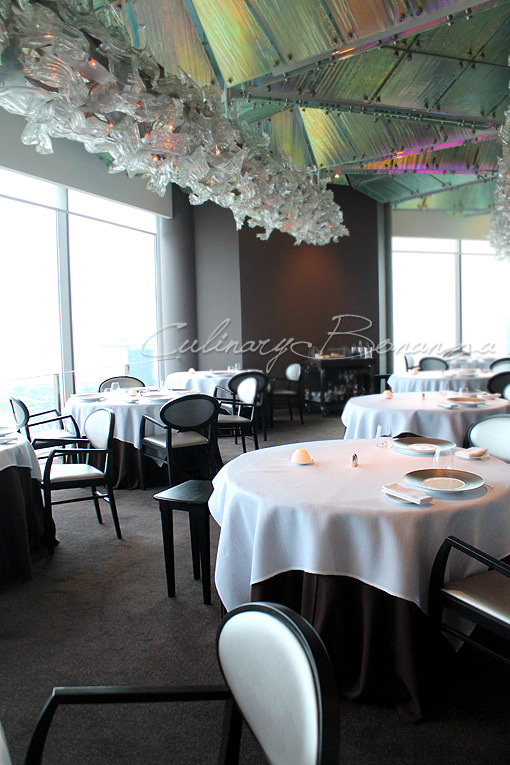 The place is an intimate 40-seats niche, comfortably nestled on the 70th level of Swissôtel, The Stamford in Singapore. The name might trick you into suggesting that this is an Indian or Asian-influenced restaurant, on the contrary however, JAAN offers Modern French cuisine. The restaurant interior features mainly subdued colours which made the Murano crystal and silver free-form chandelier that spans the entire length of the ceiling, even more outstanding. 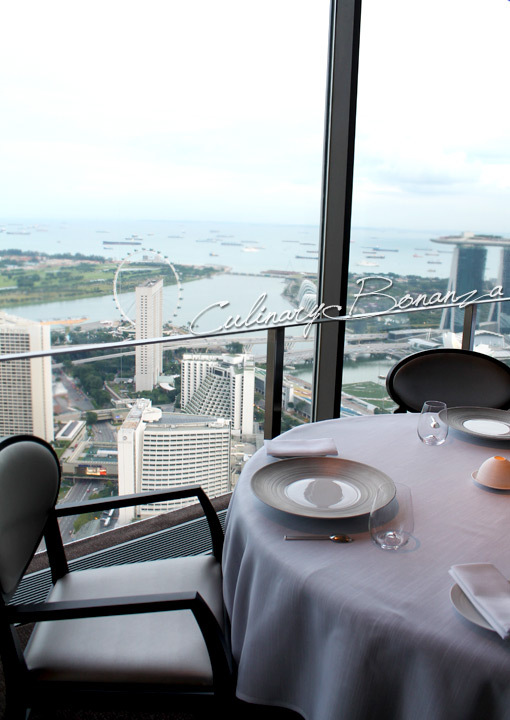 If you look beyond the windows, is the epic vista of the Marina Bay area. If you’re heard of the name Andre Chiang (who now runs his own place, by the way), he used to head JAAN’s kitchen team. When Andre left, he vacated big shoes to fill in, which Julien Royer answered to, seemingly effortlessly. Since his move to helm the kitchen JAAN has received plenty of accolades from the recent prestige title "One To Watch" by Asia's 50 Best Restaurants consortium and promising rank number 22 on the highly coveted list. 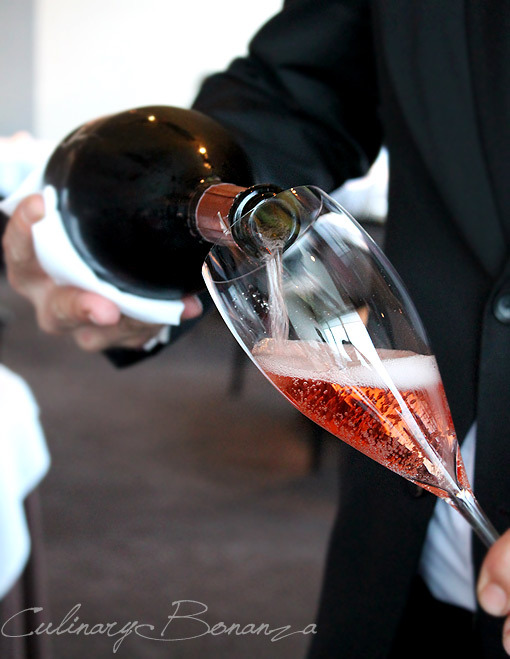 JAAN was one of only 10 restaurants in Singapore to be recognised on this list. Chef de Cuisine of JAAN, Julien Royer was inspired by the Artisanal Cuisine Movement and thus created the Artisanal Cuisine, which we were delighted to savour that fine evening. It was an extended and lavish meal that lasted until past 10.30 PM. 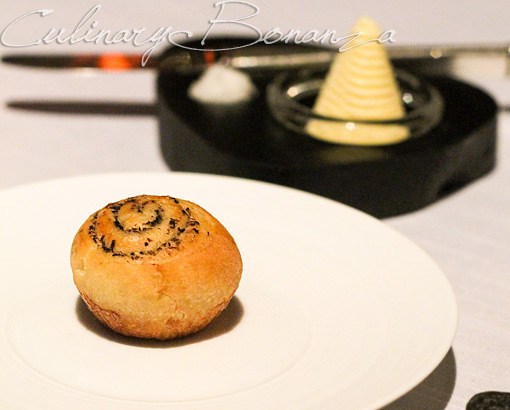 My experience dining at JAAN, 70 floors above had been elevating, to express is modestly. Every chefs' interpretations of French cuisine is different and so far Julien Royer has etched a truly lasting and heart warming memory. 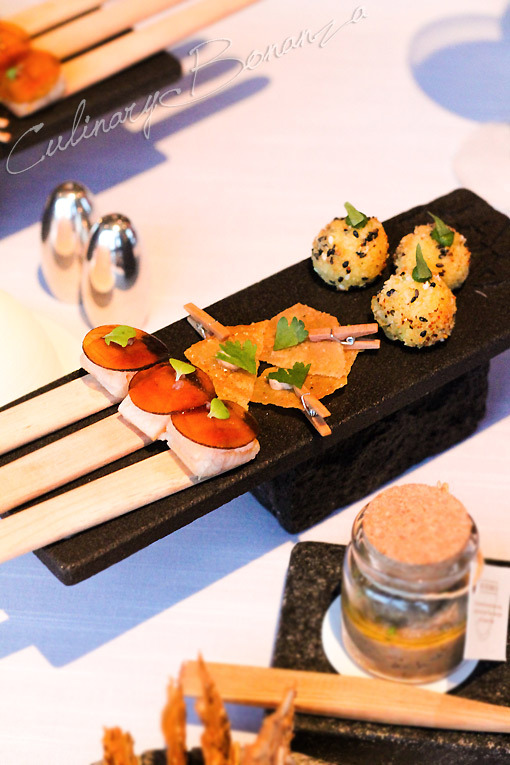 Julien Royer’s Artisanal Cuisine menu at JAAN reflects his genuine passion for cooking and the ingenuity was embodied in each of his carefully crafted dishes. If a produce could get a makeover, they would surely queue up to experience Julien Royer’s magical touch. Julien’s appreciation for the seasonal ingredients is reflected in the ingredients sourced from niche gourmet suppliers all over the world. 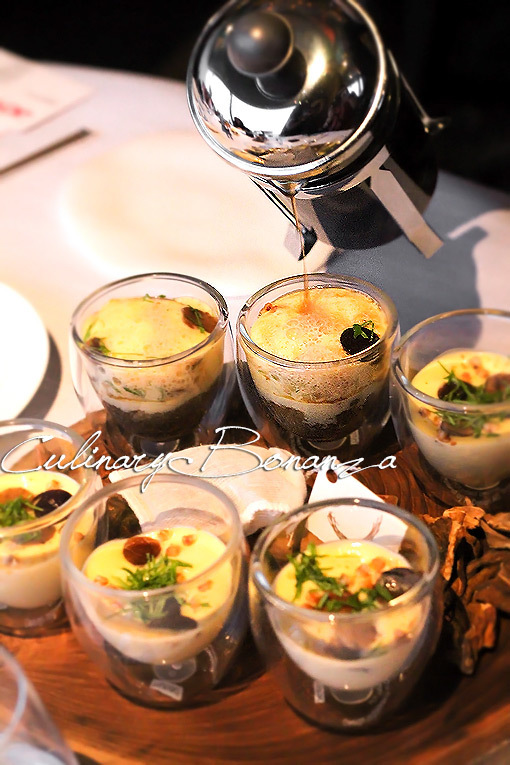 The result is an avant garde cuisine, the culmination of a chef’s appreciation for seasonality, terroir and artisan art of cuisine making. Now, allow to present you, Julien Royer's Artisanal Cuisine. 1. Cantal Cheese Cromesquis (French version of croquette balls) served with tarragon puree. 2. Crispy Chicken Tandoori - chicken skin cooked sous vide and pressed overnight and then baked in the oven. Served with a spiced yoghurt dressing. 3. Smoked Unagi paired with pickled apple & kombu jelly. Cereals Crackers and “Le Puy” Lentil Hummus dip made by Julien himself. Amuse Bouche: Wild Mushroom Tea, Cep Sabayon, Lovage And Walnuts. It was ambrosia in a cup! 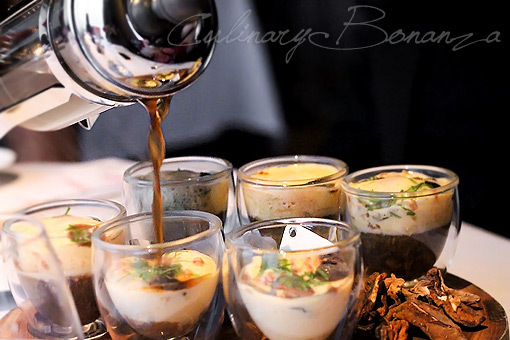 The use of fresh porcini mushroom brought the richness of the mushroom tea. Wild Caught Langoustine & Avocado Cannelloni. It is actually a type of shellfish (lobster, prawn, etc), seasoned with lime and brunoise of kohlrabi, encased in creamy avocado. 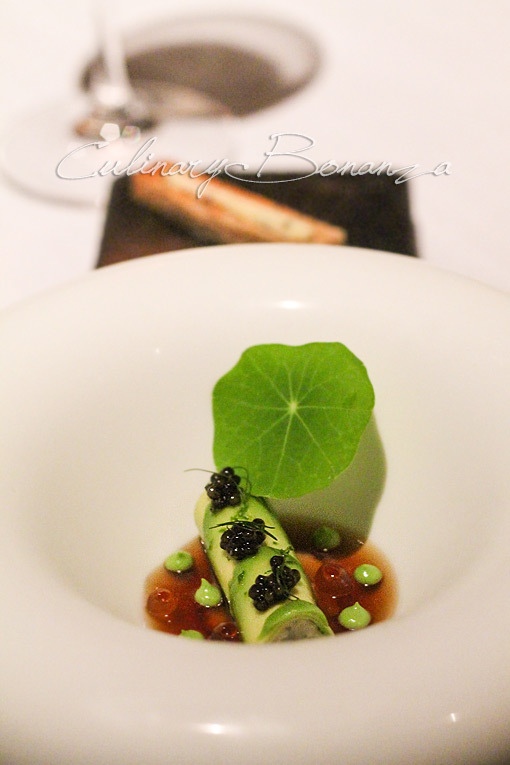 To top it off, Oscietra Caviar and a bed of crustacean jelly flavoured with dashi and drops of avocado mousse. 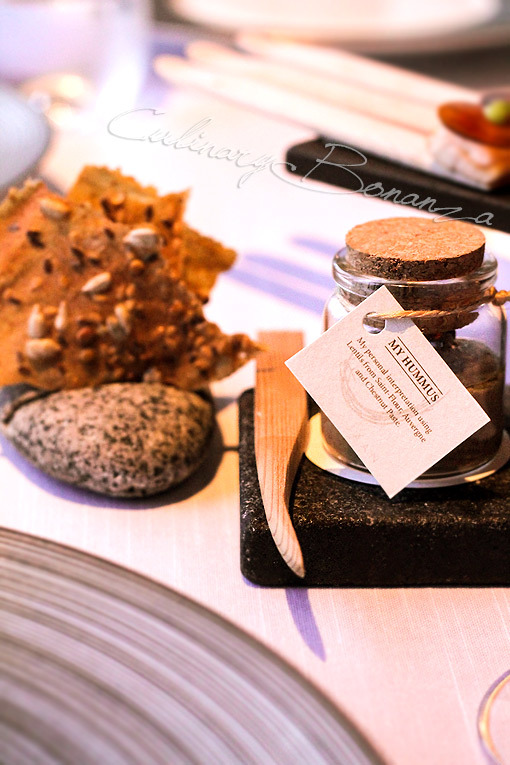 It is seved with a slice of Poilâne bread is served alongside the dish with seaweed butter spread. Jaan’s Garden - warm seasonal vegetables served with a variety of seasoning purees: lemon paste, cumin yoghurt, beetroot puree and squash puree, garnished with wild herbs, fresh walnuts, olive oil pearls and olive sugar. I told Chef Julien that I'd convert to a vegetarian if this dish is available readily at home - just to illustrate how exquisite this unassuming dish was. 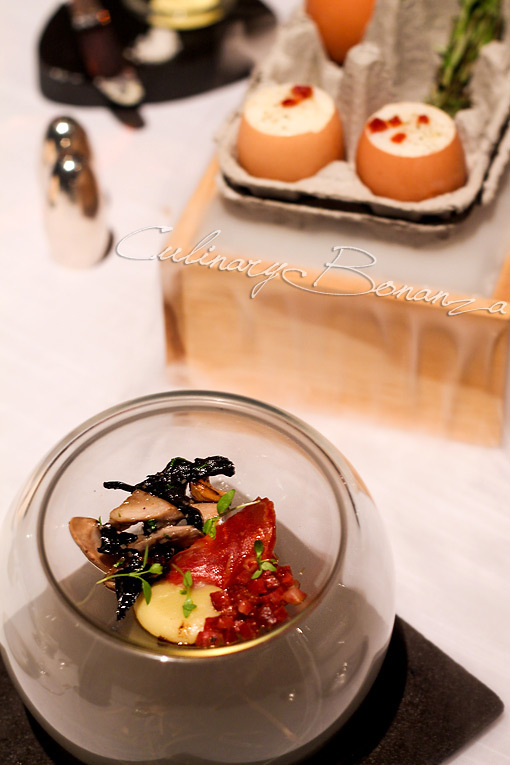 55’ Rosemary Smoked Organic Egg - organic egg imported from New Zealand, slow cooked for 55 minutes at 64 degrees to maintain its creamy translucence and mixed into a cup of sliced Iberico chorizo, buckwheat, smoked ratte potatoes mash and winter mushrooms. The theatrical presentation was only outdone by the rich and creamy taste of the combination. 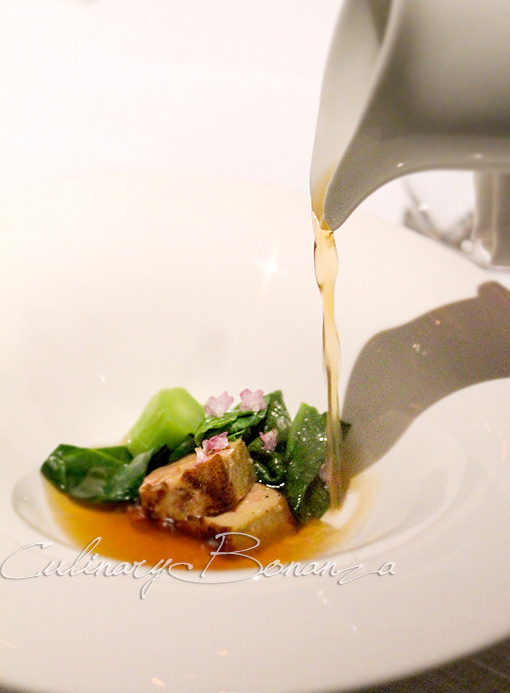 Grilled ‘Landes’ Foie Gras served with Winter Broth. Landes is a region in South West France, where the foie gras is sourced from. Whereas the winter broth is dashi stock infused with ginger, sansho leaves and served with boiled bok choy. 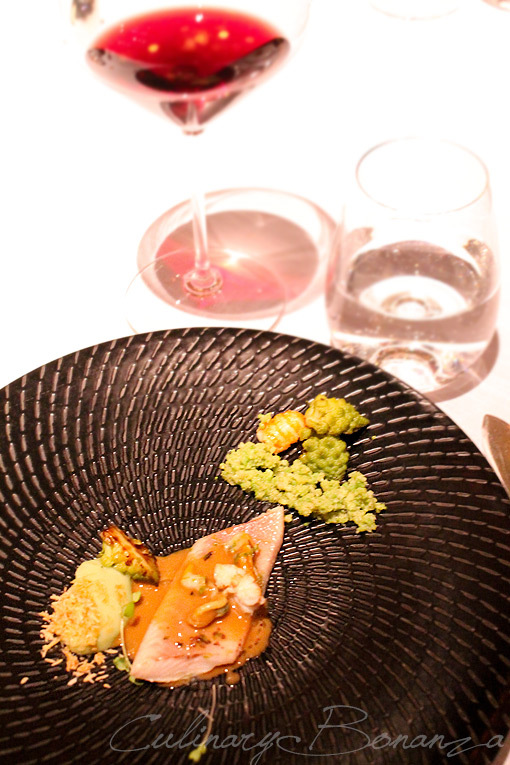 Confit Arctic Char - The fish was confited in seaweed butter, and served paired with crumbled romanesco, romanesco puree and a crayfish jus. And then, my camera chose to throw a fit at the perfect moment! Maybe it was dazed after taking photos of the previous magnificent dishes. Alas, I finished the last 3 dishes sans the lenses. Sorry if I don't have any photos to illustrate the food, but they were all doubtlessly, mindblowing. I can personally testify that JAAN lives up to all the accolades it has received so far and I believe that the recent title wouldn't be the last. One last note, I'd like to express my heartfelt congratulations for JAAN's and Chef de Cuisine Julien Royer's brilliant achievements. 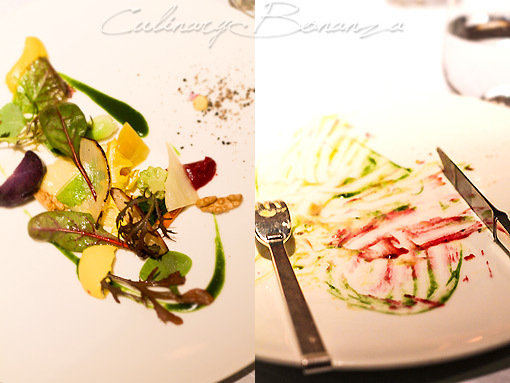 *) Expect to spend about SGD 148 for 5 course menu up to SGD 398 for 7 course with wine pairing. Price subject to prevailng Government Tax.